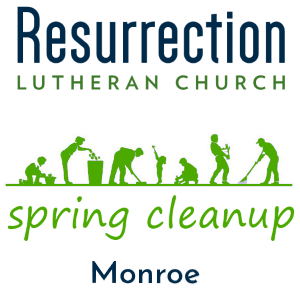 RLCNotes - Resurrection Lutheran Church Verona Wisconsin Monroe Spring Cleaning! Spring cleaning at Resurrection Monroe will take place the two weeks before Easter Sunday. There will be a sign up sheet in Luther’s Court with projects to be completed. Pick a project that you are willing to do; cross it off when it’s completed. It can be a small or large task, you can work alone or with a group, whenever you have the time. We appreciate all the volunteers to help spruce up the church building for Easter. Outside projects are not included at this time.